High levels of E. coli have been found at the Egyptian hotel where two British tourists died, tests have revealed. The independent food and hygiene tests were ordered by Thomas Cook at Steigenberger Aqua Magic Hotel in the Red Sea resort of Hurghada. Thomas Cook said: "It is clear from these results that something went wrong....and that standards fell below what we expect from our hotel partners. "It is likely that the presence of E. coli and staphylococcus would explain the raised level of illness reported among guests at the hotel during this time, supporting Thomas Cook's decision to remove our 300 customers. "However, neither our independent specialists nor Dr Gant believe that these results shed any light on the still unexplained cause of death of Mr and Mrs Cooper." 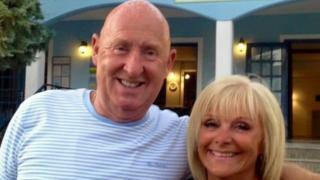 Mr Cooper, 69, died in his room, while Mrs Cooper, 63, died after being taken to hospital. The hotel's air and water quality was also tested with no evidence found of carbon monoxide, and normal carbon dioxide levels in the vicinity of the Coopers' room. Normal levels of chlorine were found in the hotel swimming pool and tests did not identify the presence of shigella, listeria or salmonella. However, Thomas Cook said its specialists were unable to access the Coopers' hotel room, which "has remained under the control of the Egyptian authorities due to their ongoing investigation". The company said it had shared its findings with the Cooper family, the Egyptian authorities and the Deutsche Hospitality group, which has a franchise agreement with the hotel. Chief executive Peter Fankhauser said everyone at Thomas Cook was "deeply saddened" by the couple's deaths adding that Mrs Cooper, who worked for Thomas Cook, was a "longstanding and much-loved colleague of ours." He added: "These results, while not establishing the cause of the tragic deaths of John and Susan Cooper, have prompted us to commit further resource to tackle hygiene standards in those hotels where we identify a higher than average level of sickness." It said it was preparing a compensation package for any of its customers who stayed at the hotel during August who said they were taken ill during their stay. Mr Fankhauser said he was "very sorry for all our customers who fell ill while on a Thomas Cook holiday at this hotel". The company has stopped its bookings for the Steigenberger Aqua Magic Hotel until further notice.